CDT MicroGraphics develops custom eLearning and information delivery solutions. We understand the importance of tailoring learning objectives to the outcomes you desire as well as the needs of your audience. 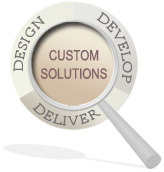 CDT works with you to design, develop and deliver custom eLearning courses in highly efficient timeframes. We provide instructional design, graphics and animation development, programming, quality assurance, management, and courseware deployment services. Our Team is proficient at developing Standards Guidelines, navigational frameworks, robust content presentation structures, and engaging interactive functionality, custom designed to meet your specific training needs and business strategy. CDT collaborates with you to accurately assess current as well as future training needs, the technology approach, utilization and training of in house resources, development of reusable course architectures, options for user and performance tracking and reporting, and integration with existing Learning Management Systems. The custom eLearning courses we develop for you are both AICC and SCORM compliant. It can be integrated into any industry standard Learning Management System. CDT MicroGraphics provides a single source solution to interactive applications development. We’ll collaborate with you to meet your urgent, one time, or long-term training and information delivery needs.